This king of benchtop mortisers is a rugged, high-quality machine with all the features found in the best mortisers, but with none of their faults. The super heavy-duty fence and hold down eliminate unwanted wood movement and "sticking chisels," (an all too common complaint with all mortisers), ensuring accurate and fast operation. 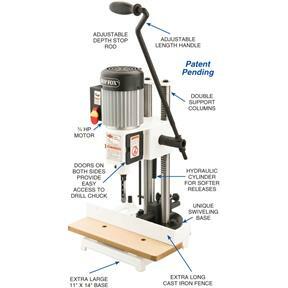 The unique swiveling base allows easy off-the-bench operations and opens new possibilities for custom mortises. 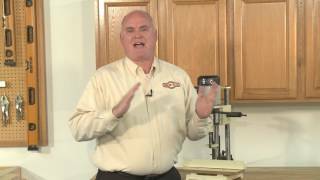 The precision 1/2" chuck eliminates the need to modify chisels and bits, and the extra height capacity allows the use of stock up to 7-3/8" thick. The all-steel, quick-adjust depth stop is easy to set and designed with a positive stop mechanism to ensure the highest level of repeatable accuracy for repeatable operations. 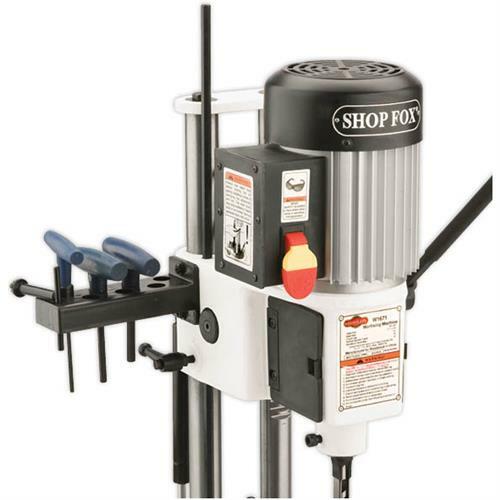 With features like an adjustable length, solid-steel, quick-positioning handle, 8-piece tool holder, easy two-door chuck access, large base, and twin hardened-and-ground columns, you'll see why this is one of the most popular mortising machines on the market! Great took but set up was a bit difficult so far this took will need what I need it for, hope will hold up over time. Delivery was quick, and delivered in great condition. Instructions could be a little clearer. However nothing most woodworker couldn't figure out. 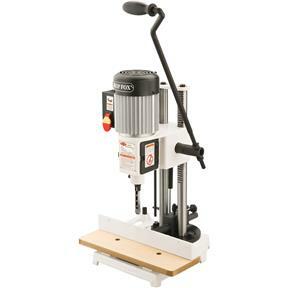 The mortising machine works great, the that comes with it is sharp and works well. One caution is to be aware of whare the mortiser bottoms out. Due to the leverage of the long arm it's easy to put to much downward pressure after you have reached the bottom of the stroke. This could easily cause damage to the machine. I have used it on oak boards and am very happy with how it works. One bolt for the table on the machine had threads that were mis-cut and would not thread correctly. I called Grizzly and was told that this bolt was on back order and would take 6 to 8 weeks to deliver. That was too long to wait so I went to the hardware store and purchased the .59 cent bolt. After that the machine has worked great. Ordering was easy, the package arrived in a timely manner, and setup was easy. After using it, I am not sure how I got along without having a Mortising Machine before this one. and couldnt go in to the cast iron base. I didnt feel like going to town for one screw, so I just through-bolted it with a smaller diameter stove bolt. If they cant catch mistakes like this in the factory, and want their customers to be able to assemble the machinery themselves, at least send some extra screws! The only obvious design shortcoming is the gas piston: there are three possible positions for it based on the stock size and mortise depth you want to achieve, but the ball joint sockets on either end are plastic. No way will they hold up to repeated disconnecting. When that inevitably fails I plan to get a gas strut with enough travel (and design a mounting bracket system) to give the machine its full range of motion from one position. Grizzly: when I do this Ill happily sell you the design. Overall its better than the POS Craftsman it replaced, but I think Shop Fox/ Grizzly would do well to assemble and test their machines before shipping. Very nice clean powerful machine. Bores right into all woods with ease. Smooth mechanisms, never binds. Chuck spins true. Overall an excellent choice. I would say that anyone who doesnt give this an excellent rating was probably using cheap hollow mortise chisels or not maintaining them. Folks, they have to be sharpened consistently, they have to be sanded smooth on the inside so the chips flow through effortlessly. 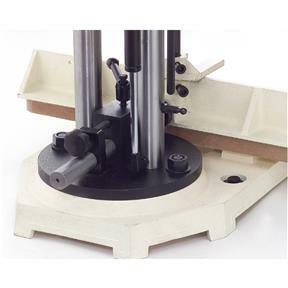 So invest in a 1000 to 6000 sanding block and 480 grit sandpaper you can wrap around a dowel by cutting a slit in the middle and youll absolutely love the mortises this machine produces and the time saved. This is the fifth machine I bought from Grizzly and have been very happy with every purchase. Also customer service has been outstanding. Thanks to all the people at Grizzly that makes this company great. I purchased this product a little over a month ago, but this unit was by no means a "Plug-N-Play" system. If did not have the skills and means to make modifications to this particular unit, it would have been shipped back. 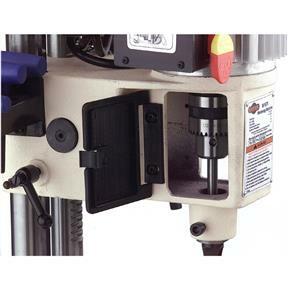 If one has metric taps and dies, can purchase alternative metric threaded locking devices, has access to round stock for a different "depth adjusting rod", has a 12" or longer drill bit to align the hole for the depth adjusting rod (boring through the housing), has a 3/8" round file to remove material from the vertical pinion bars retaining cap to facilitate clearance for the "depth adjusting rod", purchase shorter metric screws for the tool holder (the screws supplied were too long and ran into the Vertical Pinion Rod bushing) and has various measuring devices that can help determine shim stock needed to adjust other areas of the system. Then perhaps one of the other Grizzly units may be wiser to consider? Morticer is great except for the plastic ends of the shock absorber,the end that is replaceable shattered upon installation and rendered the machine inoperable until replaced. If they were made of hardened steel I would have given the tool five stars!!! Both of these items were purchased for a gift, I have the same items and have used and enjoyed them for some years. This machine does not perform as the instructions say. 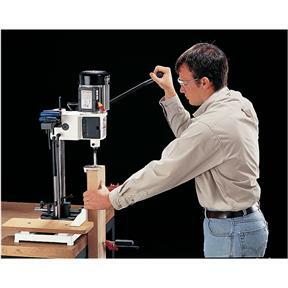 For example, it says to put the shock absorber in position 2 for stock up to 61/2" thick. This is false. The shock absorber won't allow you to raise the chisel for even 5" stock! I had to put it in position 3 and then add a bed and fence extensions to use the machine. Very disappointed here! also the method of snapping on and off the shock absorber seems cheap, and am assuming it will break soon as it is only made from weak plastic and it's holding up the entire weight of the motor etc.... Also the stroke of the arm, when mortising a 2 3/4" deep mortise into the edge of a 5" X 1 1/2 thick stock, isn't long enough to finish the mortise without hitting the stock. Thus you have to use the cog feature to re-adjust the stroke for every cut. Very time consuming! It does seem to have plenty of power, and for occasional use you can't beat the price. Wish you could fix the above problems and you would have an excellent machine! Currently I would rate this machine as fair! I checked all the wood working sites and read all the good and bad about what they had to offer then I came to grizzly . And they had the best prices and good products. and nothing but good comments from every one about this mortising machine, so far nothing bad to say about it. 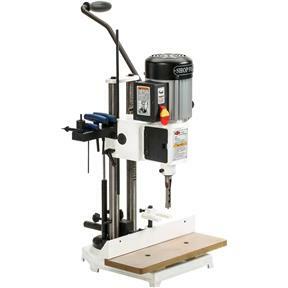 This machine is absolutely a must have for any furniture builder. I was able to cut 8 identical mortises in the same amount of time it would have taken me to fill pocket holes and I ended up with a much stronger joint and the accuracy was superb. It is crucial that you read the instructions and get everything exactly squared up and in line. My only complaint is the ball joints used for he lift arm are fragile or I got a bad one as it broke before the lift arm traveled to being fully compressed. Luckily I had an extra with mine in the box. All parts were accounted for with clear instructions. Side note: make sure you buy chisel bits that fit your machine. There are sets that say they fit all 1/2&amp;amp;amp;quot; or 3/4&amp;amp;amp;quot; collars. This is NOT true as I found out. This is my first mortising machine, and hopefully my last. Assembly was simple, although the assembly instructions are not clear. I have only used the machine a couple of times. Setup is straight forward and I was able to create good fitting mortises the first time I used the machine. This machine went together without a problem. The machine is heavy duty and cut a good mortice on the first try.